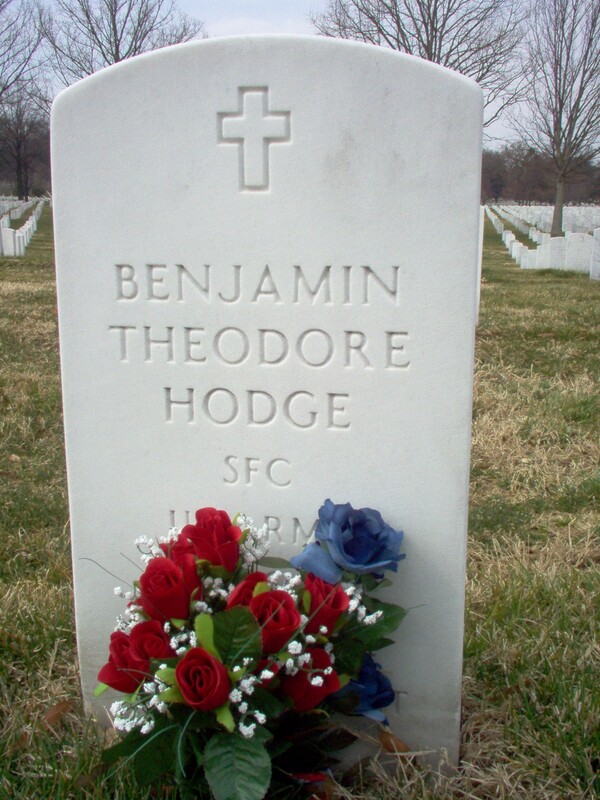 Sergeant First Class Benjamin T. Hodge entered the U.S. Army in 1979 and completed a tour of duty in Berlin, Germany. Upon his return, he attended the Defense Language Institute, Presidio of Monterey, for basic Arabic language training and the tactical interrogation course at Fort Huachuca, Arizona. He was assigned to the 519th Military Intelligence Battalion at Fort Bragg, North Carolina, from 1981-1992. He served in a variety of positions including interrogator, team and platoon sergeant and battalion S2. During this time, he served with distinction as an interrogator during OPERATION URGENT FURY in Grenada, assisting the establishment of the joint enemy prisoner of war facility. His efforts were instrumental in the collection and analysis of data to determine the size, location and resources of the Cuban force and the identification of the 10 individuals involved in the assassination of Prime Minister Maurice Bishop. In 1989, he deployed with the 519th MI Battalion to Panama for OPERATION JUST CAUSE. While there, Hodge served as an interrogator and established an automated data base for identifying prisoners and documents for the joint interrogation facility. In 1990, he again deployed with the 519th Military Intelligence Battalion to Saudi Arabia for OPERATION DESERT SHIELD, serving as the battalion S2 and liaison officer with the local community. He also served as shift noncommissioned officer in charge and senior interrogator for the XVIII Airborne Corps confinement facility in which over 8,000 prisoners were interrogated and processed. Hodge volunteered for service in OPERATION PROVIDE COMFORT in Bosnia. He deployed April 5, 1994, to join Combined Task Force PROVIDE COMFORT as an Arabic translator. He died in a helicopter crash while supporting the task force. There was nothing particularly special about Paul Barclay's young life in Oxford: He went to church, played the drums, struggled with school. But when he died last week in one of two helicopters shot down by friendly fire over northern Iraq, he was among the elite troops of the U.S. military. By age 24, was a staff sergeant in the Special Forces, also known as the Green Berets. It was what he had always wanted, said his wife of nearly 2 years, Melissa Barclay, 25. "He was 150-percent military," she said. "If for some freak reason he came back from this today, he'd go back again tomorrow. That's what he was." Paul Barclay, who joined the Army in 1988 after he obtained his general equivalency diploma, had been assigned since 1993 to 10th Special Forces Group (Airborne) based at Ft Devens, Massachusetts. That unit was sent to Turkey this month. Along with Barclay, Army Sergeant First Class Benjamin Hodge, 32, of Muskegon, was among the 26 soldiers and diplomats killed. Barclay dropped out of Oxford High School in his junior year. Besides his wife, Barclay is survived by 2 children, his parents and a sister. Service for Barclay will be at Fort Devens on Thursday, and Melissa Barclay said the family was making arrangements to have him buried in Arlington National Cemetery. Contributions to a memorial fund may be sent to: Special Forces Assn, Charles E. Hosking Chapter IV, Box 607, Ayer, Massachusetts 01432-0607. Hodge, a native of Owosso who grew up in the Fairgrove and Muskegon areas, was assigned to Company A, 165th Military Intelligence Battalion, based in Darmstadt, Germany. He lived there with his wife, Brenda Hodge, said Sergeant Dawn Kilpatrick. A service for Hodge is scheduled for 7:30 pm Monday at Sharp Funeral Home, 8138 Miller Road, Swartz Creek. Burial is to be in Arlington National Cemetery. Hodge's family suggests contributions to the Swartz Creek Assembly of God Church Building Fund, in care of the funeral home, Swartz Creek 48473.